It was a combination of things that got me to this point. The nagging knee injury, the weather, my bucket list and age all drove me to the decision to comply. Four years ago theorthopedist said I needed to find something else to do and to scale back the running. I ignored that advice and ran even more up until last year. During one of those injurytimeouts I signed up for a class. Though nervous at the onset I completed the class without difficulty. Having obtained the acquired skills I still wasn’t satisfied with my mechanics. I took another class at a different site, learned a few more things and was recommended for the next level. At age 47 I learned how to swim. Why didn’t I learn before? Didn’t feel the need. Though it was mandatory in high school non-swimmers only had to float and kick the width of the pool with held breath to pass. I passed and proceeded to spend the rest of my days sunbathing by the pool. Until now. I was always scared of deep water and didn’t understand the whole breathing thing. I still don’t have it down and deep water isn’t my preferred hang out place but I hope it will be soon because I actually quite love the water. So the work continues. You see you can teach an old broad new tricks. You too can try something new for your fitness program if you just let go of all the stuff, get clearance from your physician and jump in, the water is just fine even 12 feet of it. 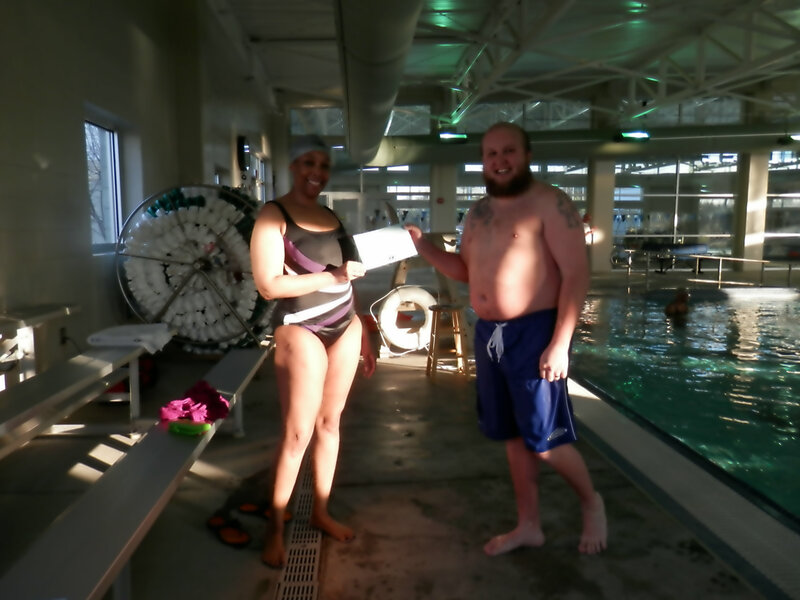 One guy made it fine for me, my instructor Michael Mooney at West Gwinnett Park and Aquatic Center. He is patient, pushy and funny all at the same time which made for an exceptional instructional experience. Thanks Michael. Until next time, see you at the pool where you’ll see me continuing to practice this whole turn your body and breathe thing while singing “Psychoalphadiscobetabioaquadoloop”. Lyric: Parliament, “Aqua Boogie“, George Clinton, Bootsy Collins, Bernie Worrell writers from the album Motor Booty Affair. 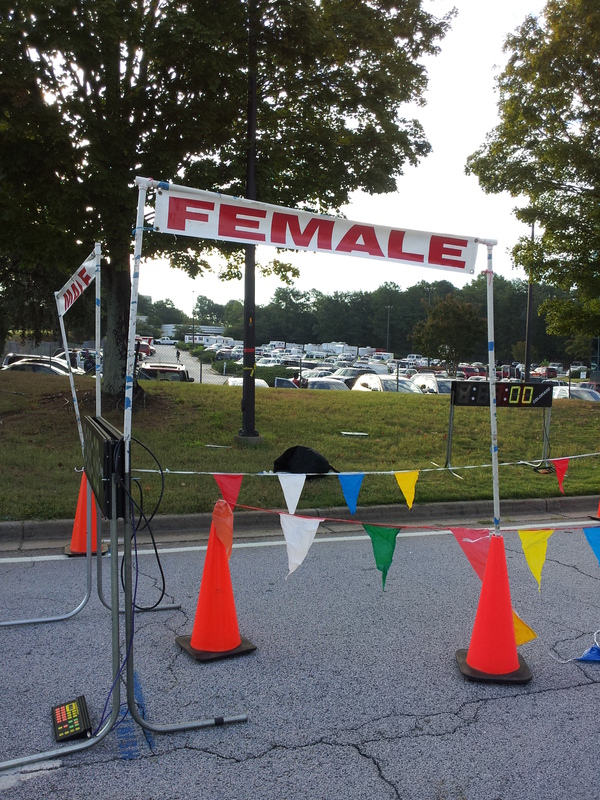 It’s kind of like mile 5 of a 10k. You’re more than 3/4 of the way to the finish line and are either feeling strong and ready to kick in high gear or feeling beat down. Either way, you are more than ready to make it to the finish line so that you can get the shirt, the medal, the food and the beer. That’s my take on perimenopause. I know the end is near and that there is a party at the finish line. What’s not like a 10-K is the stuff that happens during that time. Things are wildly unpredictable, and though you know the end will come, you have no freaking idea when. “Perimenopause means “around menopause” and refers to the time period during which a woman’s body makes its natural transition toward permanent infertility (menopause). Perimenopause is also called the menopausal transition.” The transition begins sometime in the 40s but can happen in the 30s in some women. [Mayo Clinic] I made the move last year at 46 when my body just flipped the hell out! What’s the flip out like? Menstrual irregularity – As ovulation becomes more unpredictable, the length of time between periods may be longer or shorter, your flow may be light to heavy, and you may skip some periods. I missed one and was like HELL YEAH this is about to be over! Then it came right back. The timing is so off right now, I MUST use a calendar. Hot flashes and sleep problems – Many women experience hot flashes during perimenopause. The intensity, length and frequency vary. Sleep problems are often due to hot flashes or night sweats, but sometimes sleep becomes unpredictable even without them. Never been a good sleeper and temperature-wise I’m either freezing or roasting. Then one day I just busted out sweating for no reason and was not ill. They don’t happen often thank God but when they do, I just want to be nekkid. Mood changes – Some women experience mood swings, irritability or increased risk of depression during perimenopause, but the cause of these symptoms may be sleep disruption caused by hot flashes. The cray cray, enough said. Weight gain. The hormonal changes of menopause might make you more likely to gain weight around your abdomen than around your hips and thighs. Hormonal changes alone don’t necessarily trigger menopause weight gain, however. Instead, the weight gain is usually related to aging, as well as lifestyle and genetic factors. I’d not really gained weight I lose and gain the same four pounds every week, what I did notice though was that the weight appeared “redistributed” i.e. my stomach was on SWOLE. The kicker though is that even though the lady parts are aging, if not careful a miniature human can be produced O_O. In perimenopause there’s a whole lot of stuff going on in one body. The process is part of life, a good thing, but can prove particularly worrisome. Here’s some things you can do to make life more bearable as you approach the finish line. See your doctor – if some or all of the above is going on, the first stop should be your practitioner’s office. Your doctor can run tests to rule out other conditions and let you know if you’re in transmission mode. They can also prescribe medications to help your symptoms. Eat well – as a woman of a certain age, you’re probably not eating the stuff you used to eat 20 or 30 years ago anyway. That said, though you may crave more comfort foods because of the change in your body, steer clear. Sugar and booze may feel good but too much of it can become problematic. Eat well for YOUR body. I won’t recommend any type of eating here, because what makes me feel good, may not be the same for you. Seek all the information you can and devise a way of eating for LIFE, not just the short term. For help, contact your doctor and or nutritionist. Exercise – If you’re already exercising great! Turn it up a notch by increasing intensity during your cardio sessions and increasing the weight during strength training. Not strength training? Hire a trainer to get you up and running and show you how to use proper form. Don’t worry you’re a babe, you will NOT look like the Hulk from strength training. Just understand that muscle mass decreases and metabolism slows with age and if you’re in perimenopause or post menopausal get what? You’re aging. If you’re not exercising now or need to lose weight, I can’t stress enough, make your first stop your doctor for an evaluation/clearance to get started. Don’t forget your brain – all hormonal, all the time can make you foggy, moody and you may even have bouts of depression. See a mental health professional to address these concerns. Your mind is nothing to play with. 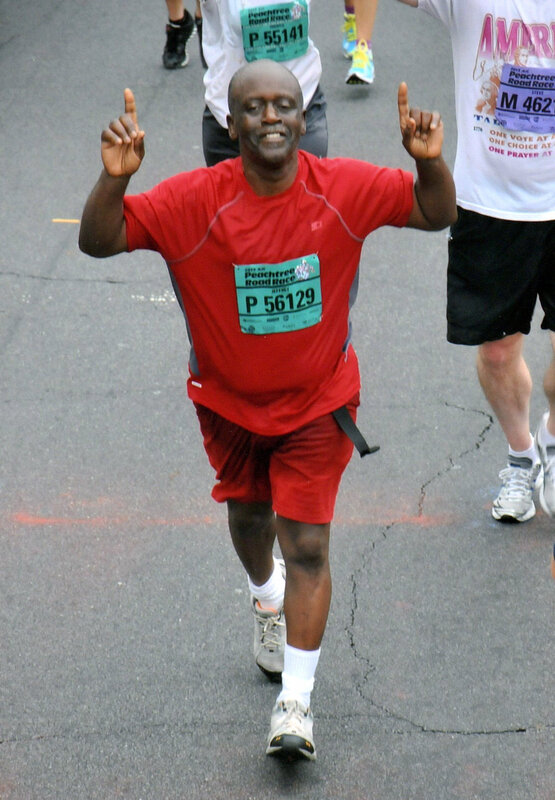 To enjoy your time at the finish line make mental health/wellness a priority. Perimenopause is not this evil thing even though sometimes it may feel like it. We’re living in a great time to make the transition because there are a number of resources and treatments available to us now that our mama’s and grandmas did not have. Take advantage of all that’s available to you and enjoy it. This might just be the best time of your life. Sources: My PCP and GYN, Mayo Clinic, WebMD, About.com, Google and my mom.